Beer bottle caps have a great start to their existence. These inverted pie crust shaped circles with the fluted edges keep fresh the golden elixir for consumption by the adoring public. One inch diameter pieces of metal, varying shades or red, green, blue, yellow, brown and white with beautiful patterns and lettering. Then, recklessly bent by harried barkeeps, thrown to the floor, kicked and stomped, swept up in the early morning hours and dumped into the trash. Some lucky bottle caps are saved, carefully washed, dried, and sorted, then transformed to organic forms of color and texture. My latest creation, organic wall art. Stacked beer bottle caps fastened to MDF board. 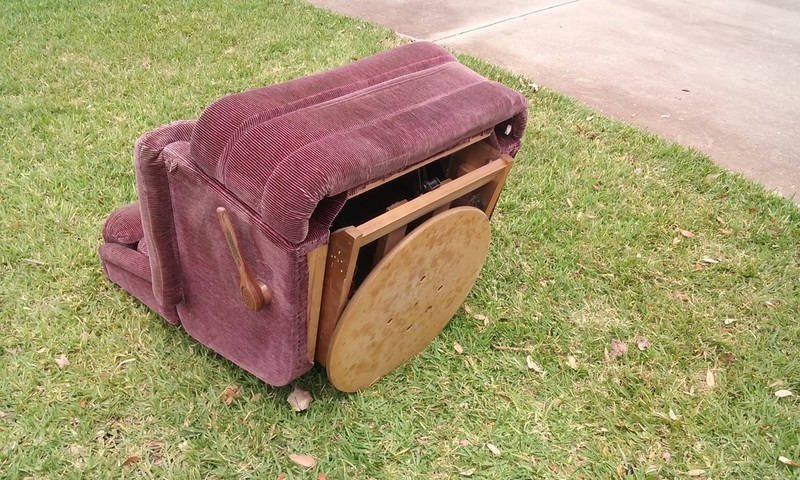 I have a hard time resisting an interesting pile of stuff that is sitting curbside waiting to be hauled off to the local landfill. 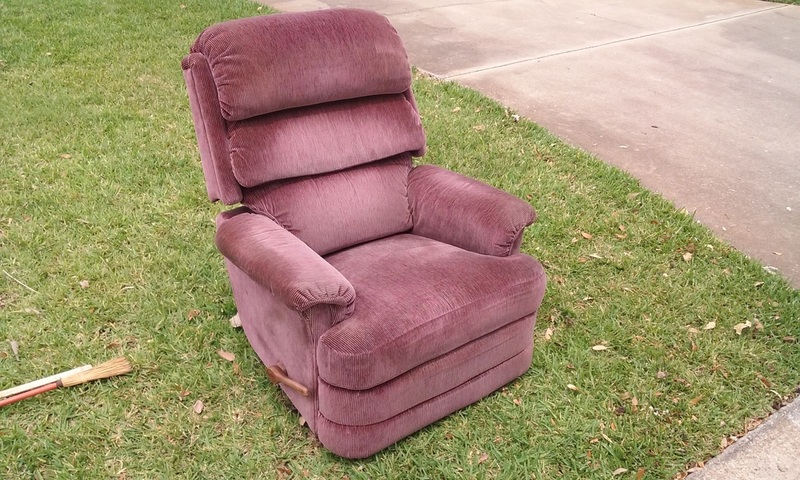 In a one year period of time, a neighbor moved out of state and threw away a big pile of stained glass, another was remodeling their kitchen and put the the old cabinets in a dumpster, a third neighbor had dragged their unwanted swivel easy chair to the road. 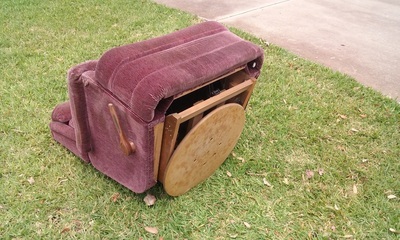 Not knowing what I was going to do with this stuff but not letting that stop me, I took all the stained glass​, dove into a dumpster to retrieve a cylinder shaped lazy susan cabinet, and stripped the heavy duty turntable off the bottom of the easy chair. 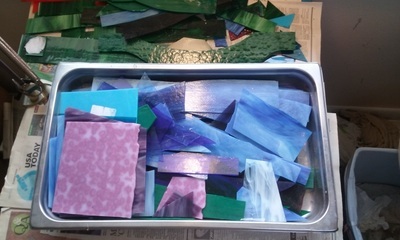 My first step in reassembling these throwaways was to cut and glue a stained glass design onto the lazy susan cabinet. I then got the idea to fasten the turntable to the bottom of it, which enabled the cabinet to spin 360 degrees and allow a complete view of the stained glass design with one flick of the wrist. This would look nice in my studio/office, but with two tables, a desk and two stationary cabinets already filling the room there was just no more floor space to fit it in. Because I seldom throw anything away, in my garage was a bracket for mounting one of those obsolete two foot deep TV's onto a wall. Hmm, why don't I use the bracket to mount the the cabinet to the wall. It would be out of the way but provide easy access to extra shelves, a sort of artsy, double spinning, turning, whirling dervish of a cabinet. Note the sturdy turntable on the bottom of this swivel recliner. A pile of stained glass. I secured the lazy susan to the turn table then secured that to the arm of the old TV bracket. The likeness of the sun regularly appeared in my earlier pieces. I have lived in Florida thirty six years and for a portion of that time worked mostly outdoors in the construction trades. August, 90% humidity and no breeze as the sun rises and envelopes me with a shimmering haze. Walking on the beach, a gentle ocean breeze, bare feet in the water. The sun is slowly rising behind distant clouds that are turning various shades of pink. The pier comes into view, then the jetty as the sun breaks over the top of the clouds, shooting rays into the sky and across the ocean. 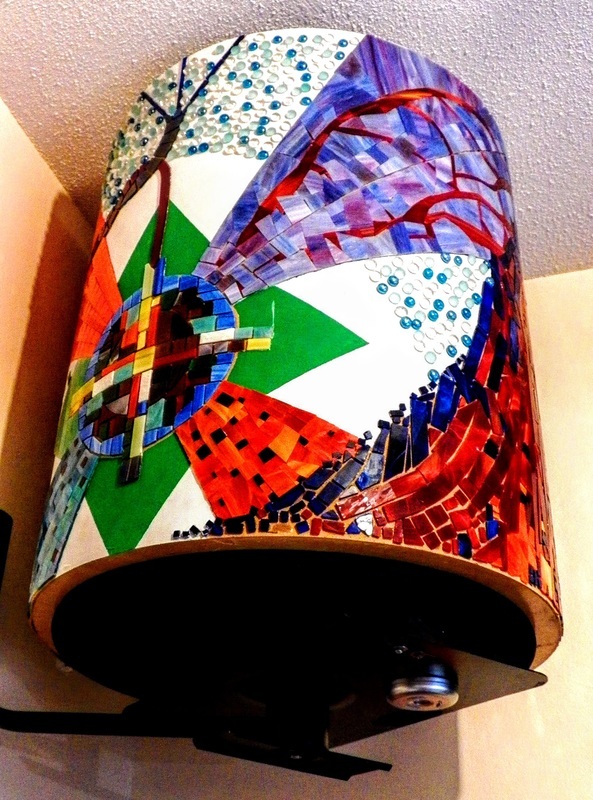 The piece on the right is made with hand cut stained glass glued onto a clear glass vase. Some of the stained glass has been upcycled/ recycled or in other words not buried in the local landfill. Its days are filled with casting beautifully filtered light from the bright Florida sun. Close ups of the Hubert Humphrey Bridge over the Indian River Lagoon. Stained glass glued and grouted onto clear glass. The Frank Lloyd Wright designed Chapel at Florida Southern College. I'm a big fan of Frank Lloyd Wright but only just recently made the 1 3/4 hour drive to Florida Southern College that was designed by the acclaimed architect. 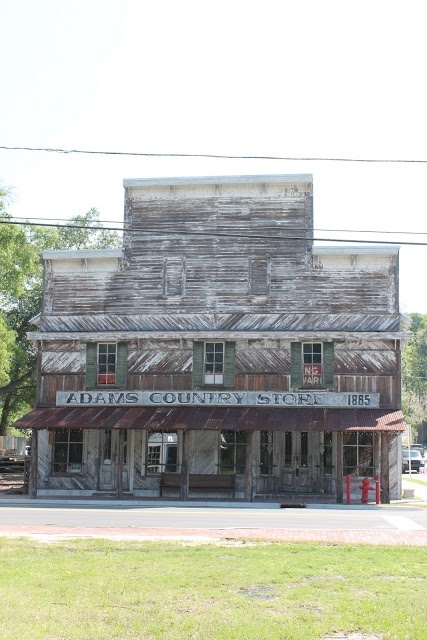 This little known Florida treasure is a must see if you like unique architectural details, historic buildings and designs that acknowledge the surroundings. 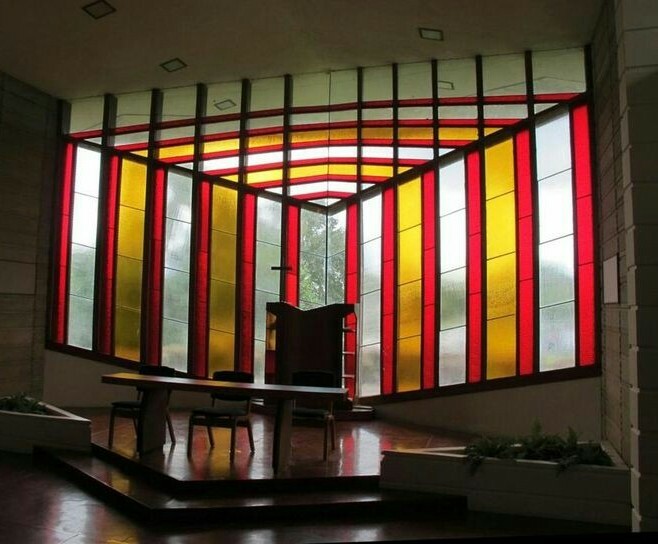 The chapel (photo above) was especially captivating, with the use of red and yellow bands of stained glass that created a magical light in the nave. 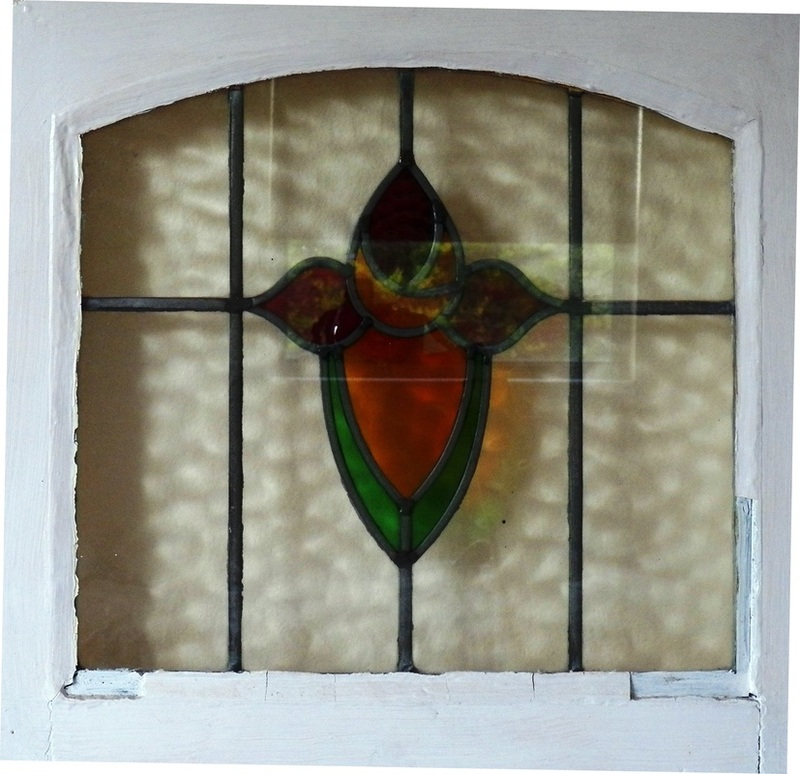 Many small openings with stained glass inserts are incorporated into the back walls of the vestibule creating light beams of red, yellow and blue. 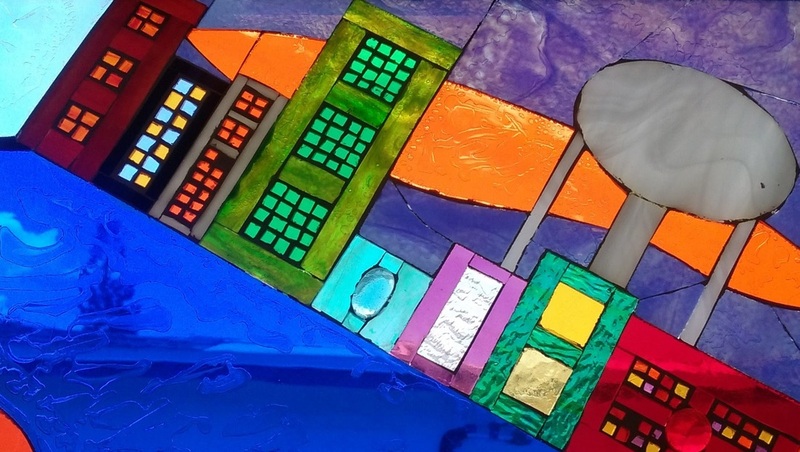 ​ Here is a link to a blog by Nat Chard that has great photos of the stained glass inserts. 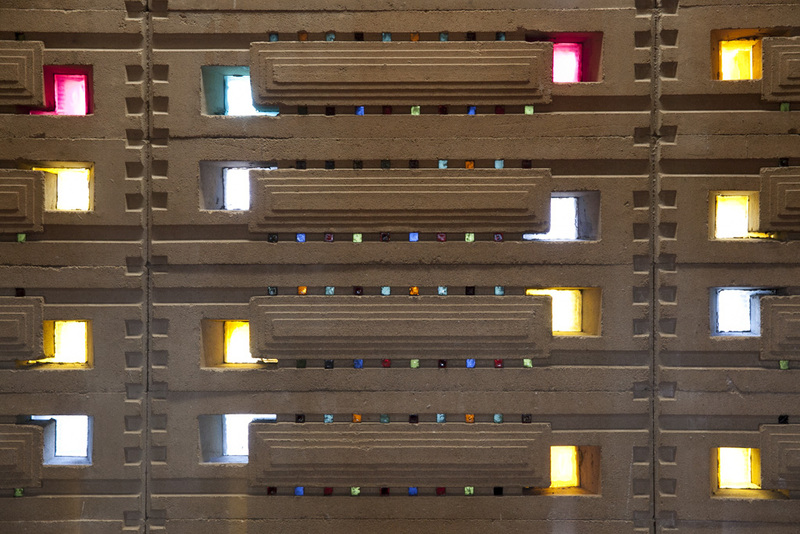 He also has photos of architectural details on the exterior of the Annie Pfeiffer Chapel. My wife in the very red vestibule. A family reunion near the city of White Springs, Florida 15 years ago gave me inspiration to explore my artistic side. While taking in the sights of this quaint little town we came across a large antique store that had well over 50 farmhouse windows with stained glass motifs. After much debating we decided on this one, representing what I think is earths abundance. Several years later I sold my first piece. Blue, gold and black stained glass mosaic pieces glued and grouted to a clear glass vase. I'm an artist/craftsman that has a bit of a fascination with stained glass. 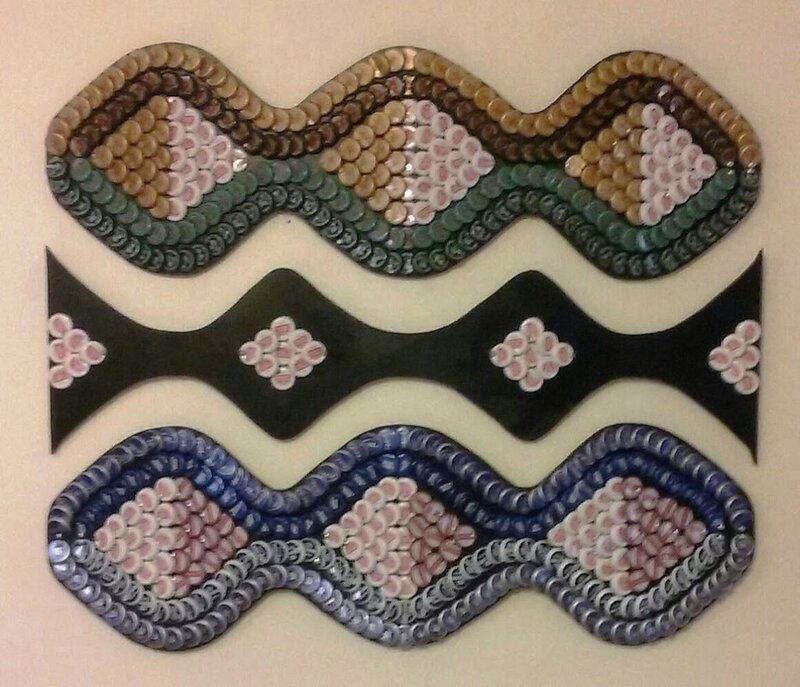 I also like to incorporate into my work things like beer bottle caps, wine bottle corks, pebbles, tiles and whatever next strikes my fancy.